After Recep Tayyip Erdoğan's elevation to the seat of the prime president minister, Ahmet Davutoğlu is taking over as the prime foreign minister. Readers should know this column has often hosted Professor Davutoğlu; sometimes, perhaps, it has been unfair to him. When the world's foreign policy intelligentsia had the habit of mentioning his name with euphemisms such as "Turkey's Kissinger," "champion of Turkey's greatness" and "always the hero of his own narrative"; here, in this column, he was one day "Dr. Strangelove," another day, "The Man Who Made Tomorrow," and another day, "The Man Who Rides the Thunder." One title was "Dr. Davutoğlu of Turkey or the [atomic] bomb party," borrowed from Graham Greene's "Dr. Fischer of Geneva or the Bomb Party." Once, this column portrayed Turkey's foreign policy like "a not-so-funny Turkish opera buffa with the main characters resembling those of [Miguel de] Cervantes's famous book." All of which should suffice to make this columnist, to put it mildly, a not-so-favorite for Mr. Davutoğlu. But his new job could be an opportunity both for himself and Turkey, not merely because he may now be distracted from trying tirelessly, and in most cases in the most futile of ways, to craft a world order that might fulfill his glorious dreams – his heartfelt tribute to the utopia of his younger years. All the same, the criticism of Professor Davutoğlu in this column has never been personal. On the contrary, this columnist knows well enough that Mr. Davutoğlu is a fine gentleman; an honest, modest, hard-working man who wants the best for his nation – although not always in the most realistic way. His tolerance to dissident opinions (how can I personally not know?) is at true Western standards of press freedoms and civil liberties, a quality that puts him planets away from the prime president minister. I hope Prime Minister Davutoğlu won't be too different from Foreign Minister Davutoğlu. Perhaps most importantly, Mr. Davutoğlu is Turkey's first prime minister – after the late Bülent Ecevit – who is purely free of any corruption allegations. Mr. Davutoğlu is Mr. Clean. Not even his opponents have ever claimed he may have been involved in any illicit activity – even remotely reminiscent of any form of corrupt practice – including the simplest irregularity worth a few cents. His children, when they grow up, are also unlikely to become exceptionally successful young business people. Nor will his relatives make millions from deals with municipalities controlled by the Justice and Development Party (AKP). Unfortunately, the fundamentals of Mr. Davutoğlu's foreign policy will not miraculously metamorphosize into reason from blind ideology. Previously, Turkey had two foreign ministers, Mssrs. Erdoğan and Davutoğlu; now it will have three. It is out of the question that the third man will not be a like-minded ideologue. So, from now, on three gentlemen, instead of two, will be fighting coup makers in the Middle East (but not in Thailand) if they go against the Muslim Brotherhood; hoping to pray at the al-Aqsa mosque in the "Palestinian capital Jerusalem," depose Bashar al-Assad, maintain a game of pretension between the neo-Ottomans and the neo-Safavids and, hopefully, working day and night for the advancement of Turkish Sunni Islamism in the former Ottoman lands. As always, they will be undecided whether they want the major western powers in "our Muslim backyard" or not; it just depends on what the problem in our Muslim backyard is, who the enemy is and whether we need the western powers' services to defeat the enemy. 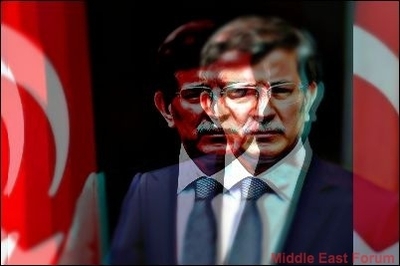 But Mr. Davutoğlu could be Mr. Erdoğan's unwilling gift to Turkey, especially if he, with his intellectual honesty, reviewed the applicability of his faith in Turkish Sunni supremacy into 21st century polity in the former Ottoman lands. Or if he stopped viewing Turkey's foreign relations with the former Ottoman lands as Turkey's domestic affairs. Or if he stopped believing he has the holy mission to correct the "incorrect" flow of history. Under Mr. Davutoğlu's Foreign Ministry, Turkey earned an international reputation that "its bark is worse than its bite." As prime minister, he should work much harder to reverse that line – the prime president minister permitting.